So I’ve got quite a bit of time on my hands this weekend in recovery and all. I’ve been watching lots of football and playing a fair share of Xbox 360. And now I can do both at the same time. Check out this picture above – the TV is a year old, and I just figured out a picture-by-picture trick it can do. 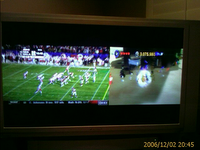 It splits my screen into 3/5 and 2/5- the larger side for football in HD and volume, the smaller for Xbox 360 in HD. Now if I just had a robot to bring me cold drinks … shoot.